Appraisers have always faced objections and challenges to their reports as soon as they leave the office. Some are preventable, such as typographical errors or taking a photograph of the wrong comparable property- after all, we are only human. Others are out of the appraiser’s control, such as a foreclosure or a loan repurchase of a property we appraised. When a loan is repurchased, the Government Sponsored Entity (GSE) or lender may turn to the original appraisal to evaluate its accuracy and verify that the observations made during the time of inspection were correctly documented. They may look to see if the contract, market conditions, prior sales history and other observations were analyzed, and that those observations, analyses and conclusions were communicated in a manner that was not misleading. 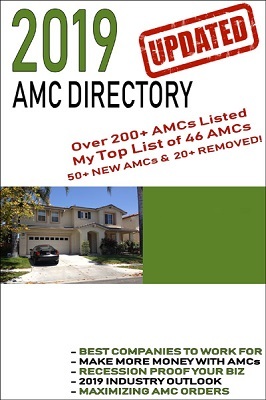 Many of us are great at documenting what we see at a property as well as communicating these observations in our appraisal reports. Unfortunately, many appraisers are not as strong at analyzing data and are uncertain of what needs to be addressed, particularly as it relates to prior sales of the subject and the comparable properties included in the report. To analyze something is to examine and interpret it. For the appraiser, it is the analysis of the data that we collect, examine and interpret. 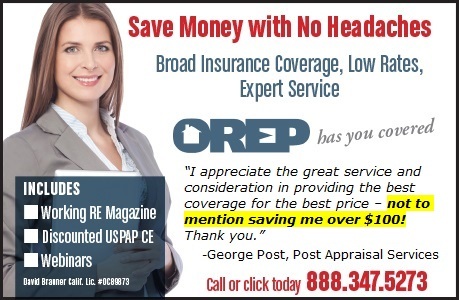 Appraisers need to report their analysis clearly and accurately to prevent future problems; “an ounce of prevention is worth a pound of cure.” Remember, most of our clients are not mind readers and may need to be walked through why there was a price increase or decrease to the subject or one of the comparable properties. Most residential appraisers whose work is exclusively mortgage related, work mainly with the Fannie Mae Uniform Residential Appraisal Report (URAR, Form 1004), Individual Condominium Appraisal Report (Form 1073), and/or the Small Residential Income Property Appraisal Report (Form 1025). While these three forms appear to be very different, they have many similarities. Each is tailored to a specific residential property type but each includes a Scope of Work, Statement of Assumptions, and Limiting Conditions. We are all so busy that it is easy to forget what is in the Certification that we sign with each report. As such, it is a good practice to read the pre-printed certification and limiting conditions pages occasionally. This is because each time we sign our report we are confirming that we have completed the items listed on those pages. There are pressures that appraisers face daily, including time pressure, ever-growing engagement letters that require all kinds of additional details and information, and the constant battle for reasonable fees. Many of us have developed language and statements that help us save time in writing appraisal reports. One thing that boilerplate and drop-down menu statements cannot help us with is data analysis. This is one timesaving corner we cannot cut. As much as we would like to think that presenting the facts about a sale is analyzing data, it is not. Analysis is more than a statement that a property sold on such and such a date, for such and such a price. The analysis includes how that sale was positioned in the market at the time of transfer or sale. Was the sale at arm’s length? Was it a REO sale in need of a total overhaul? Was the sale under duress because of some need to sell? Was it one family member selling to another? We need to address why it sold for what it did in relation to what the current appraised or final sales price is. We must analyze the prior sale as well as the current contract, if applicable, and explain and report the results of the analysis or explain why it was not performed. As markets are rarely static, we need to analyze the current market and any changes to the market since the prior sale. This analysis of the market, and how it has fluctuated, is a basis for part of the analysis of the prior sale in comparison to the current market value. Because of the requirement by the GSEs to use the Market Research and Analysis Form (1004MC), sometimes there are inadequate data within the report to support a trend which might otherwise help paint a picture of an increase (or decline). When there is inadequate data to adequately complete this form, there is nothing stating we cannot include additional information outside of the MC form. Often, those who look to find fault with an appraisal turn to this section first, because sometimes appraisers do not analyze the data presented in the 1004MC. Boxes may be checked, boilerplate statements may be added, but the data analysis is not summarized. The appraiser knows the market and knows what is occurring, but did not add a summation of the analysis or trends that may be reflected in the data. Are foreclosures and short sales an issue in the market? Appraisers may click the box “yes” yet not report the impact of those foreclosures and short sales in the subject’s market. When analyzing the market conditions, analysis is not a “should,” but a “must.” As appraisers, we are often so busy and it may seem so self-evident, but six months or a year down the line it may be very difficult to remember precisely what was happening in the market at the time. This extra bit of communication of what we observed in the market at the time can be very helpful, not only to our clients, but to ourselves in the event of a challenge to our work, months or even years down the line. This analysis of the market conditions is used when analyzing the prior sales of the subject, as well as all comparable sales. Currently Fannie Mae and Freddie Mac require a minimum 36-month sale and transfer history of the subject to effective date, and 12-months for all comparable sales since their most recent closed date. After September 14, 2015, the FHA requires 36-months for the subject and 36-months for all comparable sales. We are starting to see more ”flipping” again as the market has improved in many parts of the country. There are often examples of houses being purchased below market because they were in need of repair and then rehabbed or renovated, and resold. Were any of the comparable sales sold previously below market value due to their condition and lack of modernization? Did these houses sell for a higher, similar or even lesser amount after improvement and is this consistent with the market conditions analysis? Sometimes this cannot be determined by looking back 12 or 36-months. Perhaps the comparable prior sale sold 40-months ago, but sold at a similar time as the subject’s prior sale. Would comparing that prior sale to its current sale further support the changing market conditions? Would it support the information presented in the Sales Comparison Approach to value? If the prior sale was a “trashed-out” REO sale and there are photos in the MLS, consider including a few of these photos, in addition to the narrative, as they can add needed support for the change. As appraisers, we may have to go beyond the minimum time and reporting requirements to accurately analyze the prior sales in order to develop credible assignment results. In this example, the appraiser analyzed the prior sale, then reported this information in the body of their appraisal report. This sale, which would have generated many questions, did not. The appraiser communicated their analysis in writing instead of only keeping notes in the work file. There was no need for questions by the appraisal reviewer, especially since MLS photos showing the prior and current condition were included in the report. The Working RE story Supporting Market Conditions has one example of how to complete a market analysis outside of the 1004MC form. In short, if there are insufficient data points to provide any type of robust market analysis, include additional information supporting the position of how the market is changing or has changed, before the effective date of the report. Let the client know what has happened in the market since the prior sale of the subject as well as what has happened to the subject itself. Part of our jobs as appraisers is to help clients understand the market. The appraiser’s job has changed dramatically in the past 10 years. We are under increased scrutiny by all parties in the mortgage industry as well as state regulators, attorneys and borrowers. Those of us still in the industry are paying for the sins of individuals who were part of various financial crimes, some even appraisers. Many of those who were guilty of these sins were not appraisers, yet many in the industry, the media, and the public insist on pointing the finger at us. Some of the bad apples left the industry, by their own choice or through the encouragement of their state appraisal licensing boards. Because of this, what once was a “should,” has turned into a “must.” It is important to observe what is at the property and what is happening in the market, analyze that information, and provide at least a short summary of our analysis. Because of the massive amounts of information we are required to know and the constant changes that we see in the industry, sometimes we know much but don’t report enough. Sometimes we have to show our work. By showing our work and including our data analysis, objections and challenges of our reports will be a thing of the past. This is particularly the case related to prior sales of the subject property and the comparable sales included within the report. CU Version 3.0 is here! It promises “improvements” and enhancements that will undoubtedly affect how appraisers interact with their lender and AMC clients going forward. Be prepared! 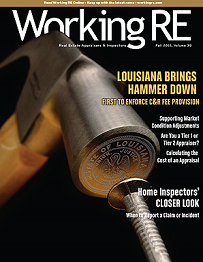 CU continues to flag appraisers for unsupported adjustments and erroneous Q&C ratings. 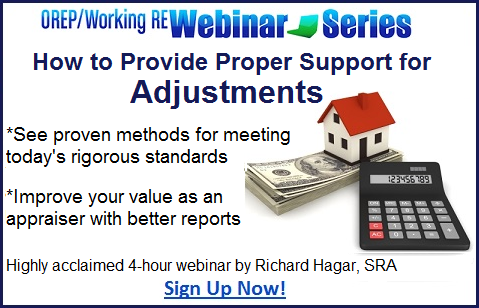 In this upcoming two-part webinar, Richard Hagar, SRA shows appraisers, step by step, how to avoid the most common appraisal failures and “get it right” with Q&C ratings. Sign Up Now! Thanks for presenting a very concise summary of an important aspect of competent appraising. My wish is that you were heard and your advise is headed, but I suspect the ubiquitous concern among appraisers will remain who is the fastest and the cheapest. Appraisers as a group have not been known by most of the users for their ability to analyze, reason or communicate. Hopefully your article will generate a change for the better in an industry that simply can’t sink much lower before it disappears altogether. I will agree with my old friend Edd: one weakness I see repeated in many reports is the lack of meaningful analysis. One doesn’t have to write War & Peace to meet the minimum standards. Thanks, guys- good article and advise! Ms Sweeney and Ms Massey; what an outstanding article! So many appraisers today; even certified appraisers simply never knew why (or how) we analyze prior sales. Personally I go back as far as I think there is relevance, but three years is a minimum for comp or subject (carry over from commercial work). Your statement below says it all. “We need to address why it sold for what it did in relation to what the current appraised or final sales price is. Maybe it was part of a bulk note purchase for ten cents on the dollar; sold for $100,000 was quick sale flipped for another $100k and THEN had the remodeling and renovation you outlined. A double flip in less than a year or two with superficially inexplicable increases each time, that become completely logical when researched, analyzed and explained. The two of you have also explained far better than I am able to, why most appraisals should NOT take much less than eight+- hours! Use of auto populating form filling software is no substitute for analysis in any portion of an appraisal. Great job!